I was thrilled to be contacted by Maty's (a natural health remedy company) to try out a couple of their products. 'Tis the season for all sorts of sinus yuck so the offer was very timely. I chose to sample their vapor rub which is one of Maty's natural remedies for coughs and their breathe better product for nasal congestion relief. No sooner had I received the package in the mail, than Diva began to get a stuffy drippy nose. I don't even understand how a nose can both be stuffy and runny. It was the perfect opportunity though to apply the vapor rub and observe the results. Night one she woke up with the affliction and we tried the rub then. Night two she was still blowing her nose constantly but it wasn't as stuffy. By night three, she had pretty much kicked the sinus issue to the curb with nothing but three nights worth of vapor rub. My chiropractor insists that a dry nasal passage is why so many people get sick during the winter months when wind and heaters dry out your nose. Your nose is your body's first line of defense against airborne germs and if it isn't moist, the germs have a clear shot further down the nasal passage. His suggestion is to always keep your nostrils moist and the breathe better product does just that. Maty's company is named after their daughter, Maty, who was born with severe heart defects. Due to her weakened immune system her parents were devoted to finding natural cures for her ailments, and thus was born Maty's company. The Maty product line includes all natural cough syrup (both for little kids and adults), vapor rubs, and breath better ointments and are available at Wal-Mart, Rite Aid, Kroger, CVS, and many other nationwide retailers. 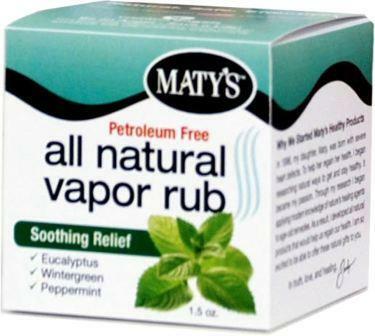 The good people at Maty's are offering one of my readers an opportunity to ride out the cold and flu season with a sample of vapor rub and breathe better. All you have to do is fill out the Rafflecopter below. A name will be drawn on Saturday, 29th of December and they will have 3 days to respond before a new name will be drawn. The prize will be shipped from Maty's and will take a couple of weeks to arrive. 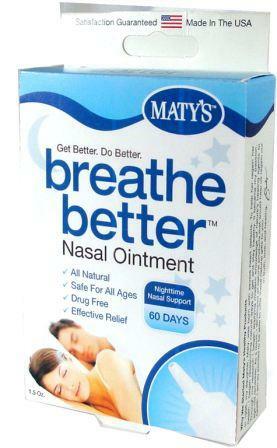 I was sent products by Maty's to sample and review. All opinions and snoring issues are my own. The winners have all been contacted. Congrats! This sounds like a great giveaway, and I would love for my name to be drawn!! I love Vicks VapoRub, and I'm sure that this one is great. Thanks for the opportunity. No but I would love to try!